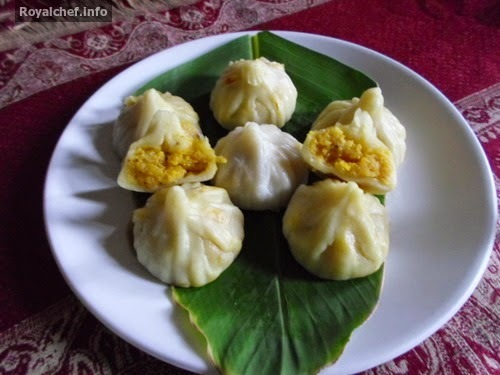 This is a very popular Ganesha Special Recipe for making at home traditional Maharashtrian Style Mango-Coconut Modak. This recipe differs from the earlier one of Mango Modak as it makes the use of coconut and has a different flavor. Fry the Khoya in a Kadhai for one minute on a slow flame. the Add Coconut, Mango Pulp, Sugar and Milk. Cook till it becomes dry. Add the Cardamom Powder, Nutmeg powder and Dry fruits. Mix it well and keep it aside. Heat two cups of Water in a vessel and then add Oil and Salt. Add Rice flour and Refined flour. Mix it well. Cover with a stainless steel plate and cook for two minutes on a slow flame. 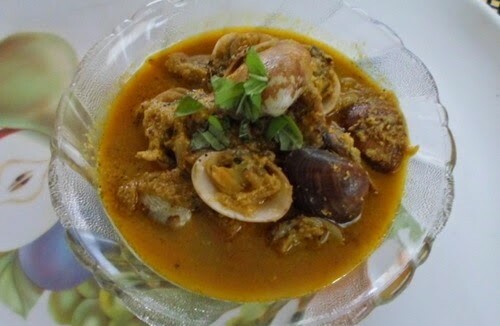 Remove from the stove and then put in a plate and add Saffron Milk. Mix it well with a wet hand and prepare a Dough. Prepare small balls from the Dough and then prepare small and thin puries on your Palm. Then add one spoon of the Mango-Coconut mixture and give a Modak shape. You can also use a Modak mould..
Heat the Water in a Modak Pot. Keep Chalni over the Pot. Keep a thin clean cloth on the Chalni and arrange the Modak or you can use a Turmeric leaf for steaming the Modak. Cover with a stainless steel plate and steam them for fifteen minutes. While serving add Ghee.